Animals are divided into various sub-groups, some of which are: vertebrates (birds, mammals, amphibians, reptiles, fish); molluscs (clams, oysters, octopuses, squid, snails); arthropods (millipedes, centipedes, insects, spiders, scorpions, crabs, lobsters, shrimp); annelids (earthworms, leeches); sponges; and jellyfish. I've been doing a lot of fussy cutting of late. It's something I can do while I sit in my recliner with a heating pad on my shoulder. Am I lazy or what? This is how I put this card together. It's a Quarter Fold, what I die cut the background using a Poppystamp die. I then layered the tags onto the card and cut the Cardinal and Poinsettia, shaped it and popped it in place. 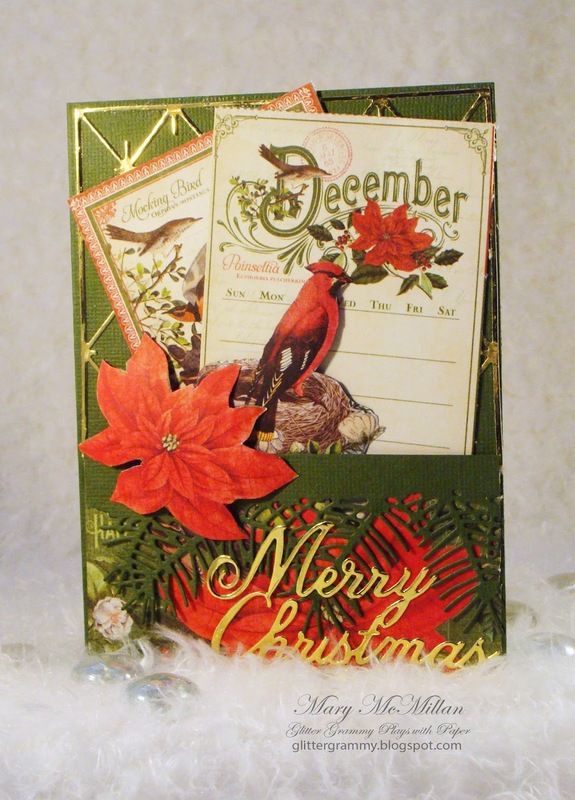 I added another die Pine Bough and another Poppystamp Merry Christmas die. That about covers the front of my card. More fussy cutting, some dies and a sentiment and this card is ready for the mail. Playing along is fun, you could win.....and you'll be one card closer to finishing your Christmas Cards, which makes you a winner! Until next time.....Happy Crafting from my world to yours. Beautiful card. Did you hand write the inside? I love your card. Very classic. Sue, I wish I had beautiful handwriting, nope, the sentiment is a rubber stamp from Stampendous - M011 Christmas Wish. The copywriter says 1995, however, I purchased it maybe only 1 or 2 years ago, so I believe it is still available. I just checked on Ebay and there are 3 of them for sale. Hi Mary, A wonderful educational post, I found it very interesting. 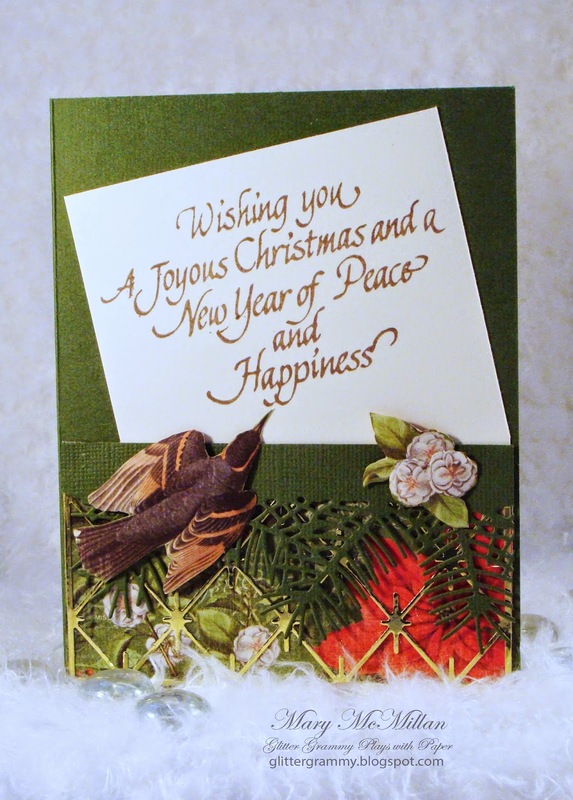 Thanks for your lovely DT card featuring the Cardinal bird,for Sparkles Christmas Challenges. Caz. Oh Mary this is just gorgeous, beautiful image and really traditional looking Christmas card, a great make.